Read your story on Amoco. Let me tell ya something... *never* take your car to a service station to have work done unless you know the mechanic there personally. It's really not a reflection on the oil company itself, and as in this case the Westgate Amoco is probably a locally owned/franchised store (not a corporate station, as most of those do not have service stations) there's not a lot Amoco can or will do, aside from revoking their franchise if they get enough complaints. Did you try contacting your local better business bureau? I enjoyed the "narvous" goat page. Shazaam! My name is Tamara Devers and I am a researcher on an NBC television show called "You Asked For It!" in Los Angeles. I was browsing the Internet a few days ago when I came across your web site about your Fainting Goats. The show focuses on interesting things around the world and your goats are just what we're looking for. I approached my producers with the idea and we would like to do a segment on your Fainting Goats. I have several questions I would like to ask you about them, so if you could contact me at (number in L.A.) I would appreciate it. My fax number is (number in L.A.) and my e-mail address is nashent93@earthlink.net Thank you in advance for any help that you can give me. Or then again may not be. The counter wasn't working so I though that I would write to you anyway. It ssems that we have a couple of things in common. Whitewater rafting and fainter goats! Go figure!!! I am in Northern Califronia [sic] so have only done the Rogue River and the American (all three forks repeatedly) so if you ever get in the area, look me upo we will raft of talk goats. Fun web page and keep that proof of education going!!!! My name is Monica Lee and I'm currently working on a new television show for Fox Family Channel called "World Gone Wild" produced by China Train Productions. It's a one hour weekly program featuring animals throughout the world. It's information oriented and each segment will have a reporter who will interact with the various experts. We are interested in doing a segment on fainting goats. I don't know if this is a possible segment we can do, but I wanted to consult with you first and see if you would be interested in participating in our show. Naturally, we will want to film the animals in their natural environment. I'm hoping you might be able to recommend experts who might be working with or studying some of the animals at your facilities or affiliated with your farm. I eagerly wait for your response and thank you in advance! yeah hey buddy - i am visitor 1200 on your web site. are you gonna give me a present or what?? eric kampe says hey to you. I stumbled accross your site accendently and had a look at your surprise birthday party photos. I was so saddened to see that your friend Annie was no more than a head. What happened to the rest of her body? Was it some kind of tragic accident? I am so very sorry. Please tell her that I'm thinking about her. I also took a look at the fainting goats. By the way, I french kissed a goat once. It was in Austria. I'd only bent over to say hello and before I knew it the goat stuck it's thick, slimy tongue right down my throat. I just thought you'd like to know. All the best, Billy. P.S. 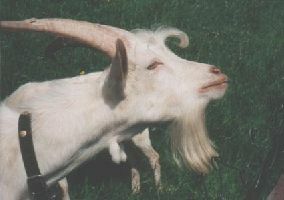 This is the goat that kissed me. "Border". Not a bad looker, eh? Hi, I was just checking out fainting goats and came upon your home page who are you and why are you so--------I've never heard about you why should everyone want to know about your achievements or what you are doing. I'm simply curious so please e-mail me back. Personally, I think you are very handsome and you have a charismatic look. FOR REAL!!!! Jim, I just stumbled upon your website and am amazed someone of your talents and busy schedule has the time to build such an extensive website. Loved the fainting goats. If you get a chance, here's a funny website to look into. I loved what they said about Elvis. Jim, I stumbled upon your page when searching for the lifespan of goats for my sister. I printed out the little blrup about the fainting goats and the picture. I wanted to say thank you for the laugh and that your homepage is wonderful. Good luck in school and with every adventure you have in life! my name is jim knapp. i go to michigan state university. go green. my full name is james frederick knapp. i just though that was wierd. i typed in my name in a search engine and your site came up. kinda wierd huh. later. I was wondering if we can use your fainting goat photo. We have a story that mentions some here in California but don't have any photos of them to use with it. Hey Jim, you look like a fun-loving guy. In fact, your fainting goat page (or some TV show that it inspired) has caused one of my friends to start shopping for one these feeble hearted beasts... way to go, bro. By the way, I hear you about the Aare river - it's one friggin cold float. I probably swam that stretch of river a hundred times when I lived in Berne - looking forward to do it again soon. If you ever get to Seattle, drop me a line - I'll buy you a beer at the local pub. For your information, the goats don't actually faint - they are totally concious throghout [sic] the process. A malfunction in the skeletal muscle chloride channel causes the muscle stiffness. The muscles contract without input from the central nervous system. Anyway, just thoguh you might be interested. The Homepage of James C. Knapp, Jr./ jimknapp@umich.edu/ Last modified 4 Sept 2001.